Design an experience for students to discover orientation events and craft a visual system to accommodate different types of events: sports, music, visual arts, social groups, and volunteering events. Provide high-fidelity mocks for searching, browsing, and viewing the details for these different events. Student Orientation can be stressful. The process of identifying and attending relevant orientation events while simultaneously starting to build a new community can be daunting. How might we offer a better orientation experience for incoming students, improve their opportunity to locate useful events and help them meet peers with similar interests? To better understand the problem space, I employed three research techniques: Content Inventory, Surveys, and Interviews. Some events are only offered once. Based on these findings I was able to focus my line of inquiry through the use of surveys. Only 18 of 60 (30%) students attended the event staged by the department in which they are currently majoring. 55 of 60 (92%) students said they attended orientation events with friends. Only 8 of 60 (13%) students said they still have relationships with the person(s) they attended orientation with. These trends were then examined in select interviews. I interviewed 3 students that attended orientation at the University of Washington, one as a transfer student, the other two as incoming freshmen. Below I have highlighted 5 quotes which helped me to frame insights. I got a lot of interesting insights from my conversations, and it was clear there were some similar themes across all of my subjects. students do not feel there is enough time to review the vast assortment of events offered. Students feel more comfortable attending events with a friend and in some cases will only attend events if they have a friend to go with. Students need more time to plan their orientation schedule because there are over 200 available events. Students need to be able to choose events and build community prior to the start of orientation. Students need to know who is attending orientation events so that they can feel comfortable attending the events they consider most relevant. How might we create an orientation experience for incoming students that allows them to review all the events offered, plan their experience and maximize their comfort in participating? To help flesh out the features I developed through my narrative, I created a number of quick low-fi wireframe sketches. These mock-ups helped identify more specific interaction points and flows from screen to screen. In developing this high fidelity prototype my goal was to refine the look and feel of the features I designed through my insights and paper prototypes. I looked at a number of Google apps including Calendar, Gmail, Play and Newsstand for guidance on navigation paradigms and styling. 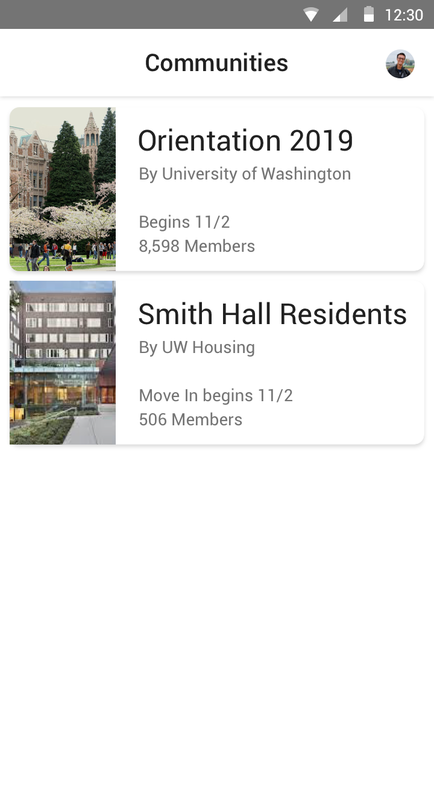 I developed these screens in Sketch.I crafted a solution which the university could make available to students through the Google platform which I named ‘Communities’, which universities could offer to incoming students. The ‘Orientation 2019’ page found within ‘Communities’ opens three months prior to orientation. This enables students more time to browse through events and make thoughtful selections. Students need to be able to choose events and build community prior to the start of orientation. Students need to be able to join student organizations even if they are unable to attend the University of Washington Club Fare. Within ‘Orientation 2019’ students would be able to explore and join student organizations prior to arriving on campus. This enables students more time to browse through events and make thoughtful selections. Students need to feel comfortable exploring new clubs and groups. 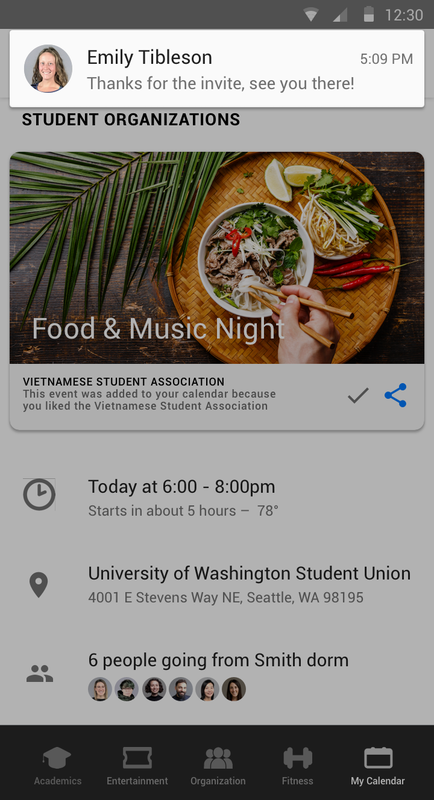 By tapping into an event students can get more information including; information about other attendees as well as an option to share the event with other members in the community. If student wanted to attend an event, but felt uncomfortable going without a friend this would allow them to share the event with other community members. In addition, organizers reach out to students who express interest via the platform. Through my research, I realized that the most important piece of this problem was managing the complexity of this web of events, organizations and classes in a way that made it more approachable and unintimidating. Here Sam can browse through events offered at orientation. Sam presses 'Organizations' in the navigation bar. Sam 'likes' The Vietnamese Student Association by pressing on the heart icon. Sam then goes to the Events page. By pressing the Events icon in the navigation bar. On the events page, Sam can see events added to his Google Calendar based on his preferences. Sam clicks on the event page, ‘Food and Music Night’ to see more about it. Sam notices that six people from his dorm are also attending the event. Sam wants to go but, also wants a friend to go with him so Sam clicks on the share button. Sam then invites his friend Emily to the event. Emily thanks Sam for inviting her. Emily accepts Sams invitation which Sam can see by looking at the the ‘Food and Music Night’ event page. I had a lot fun working on this design challenge. Over the course of the week I spent a couple of days working on research & analysis (including interviews and research events), brainstorming, design & iteration, animation, and finally presentation. *This research was done with students at the University of Washington.